We were greeted with this magnificent display of color” upon entering the quilt show. 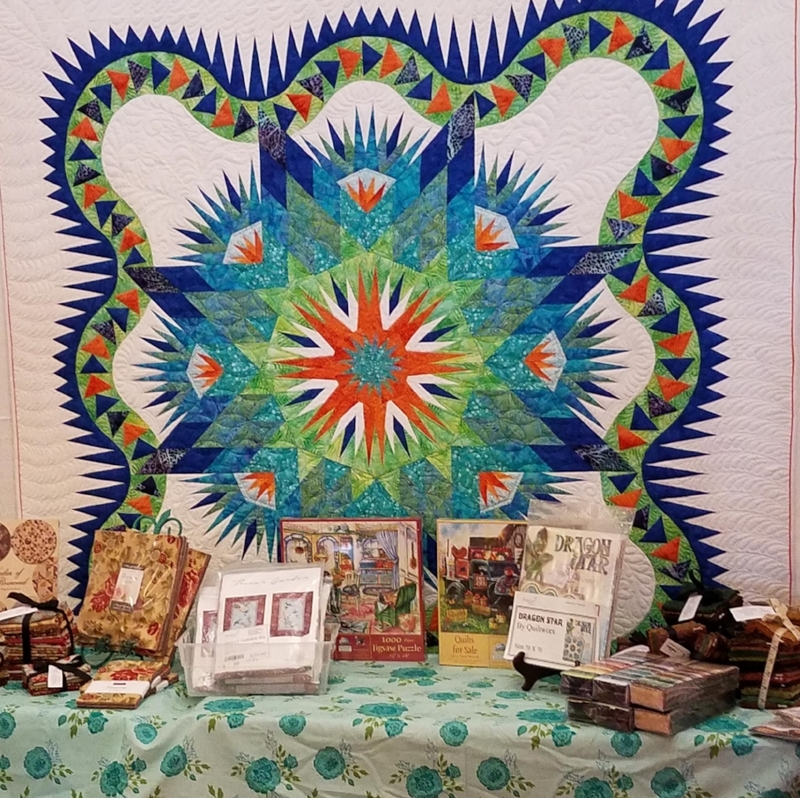 “Do you want to go to the quilt show in Brandon,” queried my husband on Thursday evening! The quilt show was scheduled for Friday and Saturday. He knew that we couldn’t go on Friday, so he was attempting to help me get away from the rigor of my crazy work load and schedule. Then, I softened it with an addendum, “Not unless I’m done with the taxes. I absolutely MUST be done with those horrible taxes.” Now, we had filed a 6 month extension back in April and October 15 was just about upon us. So, though I had tried to work on them on Monday and Tuesday, that had NOT happened, and now I was down to the wire. I knew that there was NO way in the world I could enjoy the quilt show with those things hanging over our heads (especially mine), so I got motivated! With the idea of, “I can go and play, if I can stay focused” in the back of my mind, I got out the program that I had started earlier in the week, and tackled it with a focus I hadn’t had since about this time last year! Thankfully, most of our paperwork was in order, and I had only a few things that I had to check in with my accountant brother about, and by 9 a.m. Saturday morning, I was finished. By 10:30 a.m., they were printed and signed and delivered to the post office! I was ready for my day. (By the way, the part that I had to print and keep for myself was 491 pages. I think I only sent about 40 pages to the IRS.) We had previously done our two corporations’ taxes, so I had only to add in the personal stuff that wasn’t corporate. However, it was an incredible amount of paperwork! By 11:15 I called him, and he hustled back home. By 11:45, we were heading down the road and inside to the Piecemakers Quilt Show held at the Regent Center by 12:30 pm. Now we went to this what turned out to be “quite impressive” quilt show with new eyes. I had been to several other quilt shows before, but this time, since opening Quilted Twin.com, I knew that I had a whole new perspective. “How hard are the quilts?” “What booths seem to be getting traffic?” “What looks good?” “Which booth has a crowd?” “Is anyone selling anything?” “Is anyone having a grand old time?” “How do I win prizes?” “Is anyone selling fabric?” “How are they doing it, if they are?” “Will our local quilt shop also be there?” The questions just swarmed through my mind, as I stepped inside the huge room at the Regent, where the quilts were beautifully displayed. Today’s pictures will feature the quilts! Tomorrow I’ll focus on the booths, with some closing comments!